Apple has quietly launched a lower cost $999 iMac for educational institutions this morning. The new low-end model is labeled "Education only" and is not available for individuals. The new iMac appeared on Apple's Higher Educational online store early this morning. The specs now have been published on the site and reflect the following reduced features. Interestingly, this new iMac does not have Thunderbolt, just a mini Display Port. The next higher model is $1149 and offers a 2.5GHz Quad-Core i5 with 4GB of RAM and 500GB hard drive. Apple, in the past, has also offered special education only models for institutions. These larger educational purchases may be more price sensitive than the rest of the market, and Apple has adjusted the hardware down in order to fit the sub-$1000 price point. Apple appears to still offer an even cheaper $899 20" iMac that houses the previous generation Intel Core 2 Duo and does not even appear to include OS X Lion. Nice, I'm in for 0 of em! Also, I wonder why Apple would want their slowest, worst machines to be the ones used in education. It will be the first experience a lot of kids have with a Mac. You'd think they might just offer some extra volume discounts to education on their standard models. I can't see this being popular, bearing in mind that the vast majority of schools and universities, at least here in the UK, are still based around Windows. And the fact that a model with a vastly better processor is only $150 more. and FOUR (!!) GB of RAM. Common, Apple, really? 2GB for Lion by default in an iMac? I bought my first iMac in 2007 and it had 2GB. A lot of schools won't require the performance nor will they have power users. 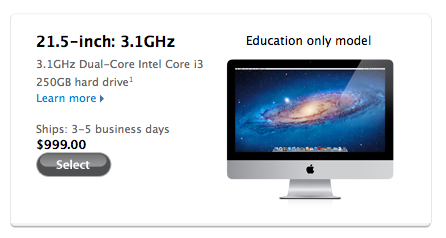 The specs Apple are offering are enough for your average school needs. A lot of lab machines and public computers at the library at North Carolina State University are macs. The 2GB of RAM is kind of lame, but the HDD space won't matter for most universities as most give users network space on the University's servers (So that you don't have to sit down at the same machine every time). But the 2GB of RAM is easily upgradable by the IT department at a later date, and for a much cheaper price. The only bad part of this deal is the dual core i3, but it will still be plenty fast for the majority of student tasks. Having served on my local school board and gone through three budget cycles, I can say with certainty that magic numbers like "under $1000" are indeed important. In our district we use iMacs up through grade 6, PCs after that. The kind of things that PCs are used for in grade school are not CPU intensive, so spending 15% more on a better CPU is not likely to happen, even when that 15% is "only" $150. Does it come with a wired keyboard and mouse? I'm sure students would hate having to change batteries. The problem with the wired mouse at uni is that half the scroll wheels don't work any more due to excessive use... the keyboard's alright though. Cost cutting measure I guess. I love the imac but I would be really disappointed if i was a student and they bought these. Of course it depends on what type of school too but really would prefer mac pro's over a room of low end imacs. Sure. I'm sure most kids would enjoy driving a Ferrari when they reach driving age too instead of something more modest. Seriously, this model is meant for secondary and high school markets -- and for general curriculum courses like math, language, etc. It would be a waste of money to buy MPs where that kind of processing isn't required. Apple is trying to sell their leftovers. It is crazy they are trying to make money with schools. This was never a regular model, so how could it be a "leftover." It was created for educational needs. Since when is an 3Ghz i3 a left over anyway. Also I don't know any company that sells their wares to schools at a loss. Businesses have to make money to pay for employees & satisfy investors. Do you realize that publishers require public libraries to pay full list price for books? Unlike book stores, they get zero discount, the rationale being that many people will read the library copy and not buy their own. Lion runs fine on my 2006 core 2 duo 20" iMac with 2gigs of RAM. None of the above are power intensive and can all be easily handled by the iMac for Education. The only graphics-intensive application a high school or university might use is for engineering / architectural courses when utilizing AutoCAD, CAM, or some other GPU-intensive programs. For those students, the schools tend to buy a small amount of computers which are able to handle the computing workload.